I joined the team at Oaks in November 2017. 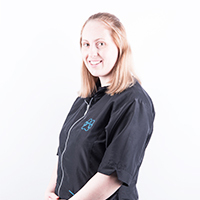 During this time I have been studying to become a qualified groomer completing the City and Guilds Level 3 qualification. There are not many fully qualified groomers around so I am very proud to have achieved this. Before entering the world of grooming I spent many years in the veterinary industry as an animal care assistant. I enjoyed my role very much but after 12 years I am enjoying the change and variety in grooming. Joining the Oaks has allowed me to train and work as a groomer but still keeping me in the veterinary environment which I love.